Aptamer sometimes referred to as “synthetic antibody” is the stable DNA, RNA, or peptide that binds with high affinity and specificity to targets such as small organics, peptides, proteins, cells, and tissues, unlike antibodies, some aptamers exhibit stereoselectivity. Aptamers are emerging as a key player in numerous applications such as drug discovery and therapeutics development, in addition to biodefense, food science, and more. Goldstein Research analyst forecast the Aptamers Market size is set to reach USD 5.1 billion by 2024, at a CAGR of 67.2% over the forecast years. The report covers the present ground scenario and the future growth prospects of the Aptamers Market for 2016-2024 along with the adoption rate of aptameters in various applications and the ongoing research in aptamers. We calculated the market size and revenue share on the basis of revenue generated from major players across the globe. On the basis of end user, the academic and government research institutes held the largest share (37.8%) of the aptamers market in 2016. The biotechnology and pharmaceutical companies are expected to be the fastest-growing end-user segment with the CAGR of 70% between 2017 and 2024 due to high demand of aptamer molecules across a diverse range of medical applications. Aptamers Market Outlook 2016-2024, has been prepared based on an in-depth market analysis from industry experts. 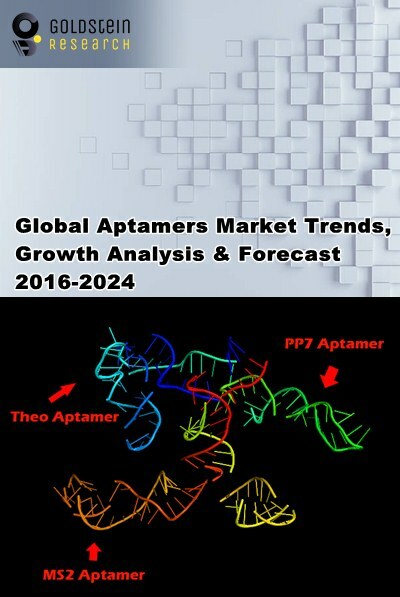 The report covers the competitive landscape and current position of major players in the global Aptamers Market. The report also includes porter’s five force model, SWOT analysis, company profiling, business strategies of market players and their business models. Global Aptamers Market report also recognizes value chain analysis to understand the cost differentiation to provide competitive advantage to the existing and new entry players. Our global Aptamers Market report comprises of the following companies as the key players: Somalogic, Inc., NOXXAN Pharma AG, Aptamer Science, Inc., Aptagen, Inc, AM Biotechnologies, LLC, Aptamer Solutions Ltd., Aptus Biotech S.L., Base Pair Biotechnologies, Inc., NeoVentures Biotechnology, Inc., TriLink BioTechnologies, Inc., and Vivonics, Inc. According to the report, major driving factor for Aptamers Market is its diverse application in diagnostics for instance, biomedical diagnostics for detection of disease biomarkers. Diagnostic-based aptamer kits have been developed for detecting mycotoxins and aflatoxins. One very interesting technology developed by Aptagen is the aptamer-beacon (i.e., Apta-beacon) technology which can be used for rapid biomarker detection. Further, the report states that the limitation of aptamers includes the rapid clearance rate from circulation due to their small size and degradation by nucleases for the unmodified aptamers. However, these limitations can be easily resolved by chemically modifying the aptamers. Based on geography, North America lead the Aptamers Market with the market share of 40% in 2016 due to growing incidence of life-threatening diseases such as cancer which has directed many companies to introduce new & effective detection assays based on aptamer therapy. Europe region is expected to witness strong growth at a CAGR of 68% owing to presence of key players in the market while Asia Pacific has the potential to register positive growth owing to increased opportunities in diagnostics and development of pharmaceuticals which are remain untapped in the aptamers market. What is the total market size of global aptamers market by 2024 and what would be the expected growth rate of the market? What is the revenue of Aptamers in 2015-16 and what would be the expected demand over the forecast period? 6.2.8. Base Pair Biotechnologies, Inc.